Alumni Tom Moore and Garrett Waldron, ‘17, were honored this past Friday by receiving certificates recognizing their All-American selection for the 2017 season. Following in the footsteps of BU head coach Kevin McKeown, alumni Tom Moore and Garrett Waldron, ‘17, were honored on campus as All-Americans on Friday. 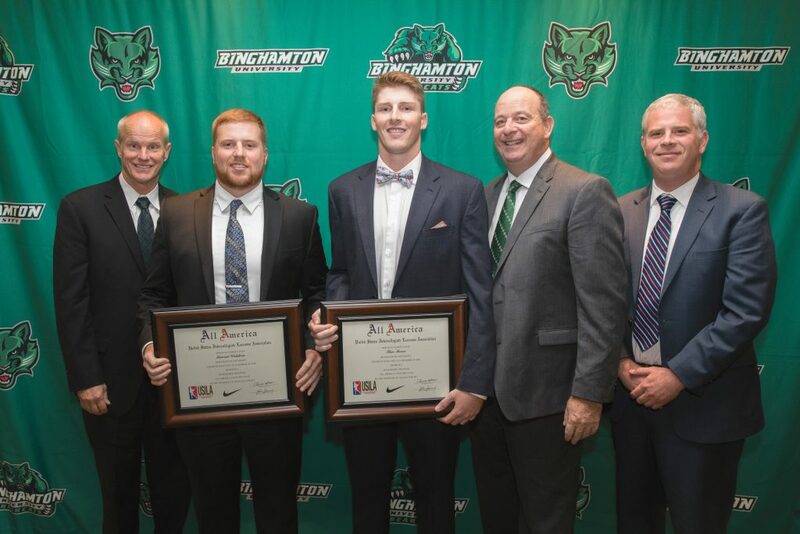 The recent graduates are the second and third All-Americans from the men’s lacrosse team and the 14th and 15th All-Americans in the Binghamton athletic department’s history. With two All-Americans being selected from the team in the same season, and with 11 wins earned to set a new program record for victories in the 2017 season, this event also serves as a culmination to what is described as the most successful lacrosse season in program history. Not only did Waldron finish the season last year with 42 ground balls and 19 forced turnovers, but his versatility and tenacity on defense are what separated him as an All-American. Waldron started 11 games in 2016 before suffering a torn ACL. Despite not playing in the season’s final three weeks, he was quick to emerge as a leader and became the captain of the team. In regard to Moore, McKeown spoke on his character and the unique experiences that shaped him for his breakout season last year. Moore broke the Binghamton single-season records for both points (73) and goals (48). He finished the season ranked sixth among Division I players in goals per game (3.00) and 13th in points per game (4.56). The former BU standout was drafted in the sixth round of the Major League Lacrosse draft with the 47th overall pick by the Atlanta Blaze. As the current lacrosse team looks to follow up on of one of its best seasons, Moore will be moving on to his new career as a professional athlete, while working at RAS Boriskin law firm and applying to law schools during the offseason. Waldron intends to work at National Income Life Insurance Company.